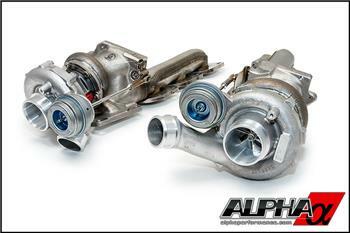 Alpha Performance Alpha 9 Turbo Kit - Mercedes 5.5L BiTurbo MERCEDES-BENZ - Dezod Motorsports Inc - Home of the automotive performance enthusiast since 2002. The Alpha 9 BiTurbo Upgrade for the Mercedes Benz 5.5L BiTurbo (M157) produces the most power available on the market without compromise. By utilizing the latest in billet wheel, ball bearing turbo technology, we have brought you 900+HP capability with no loss in driveability or response! While other turbo upgrades available feature just a simple compressor wheel upgrade, we chose to upgrade the whole turbo to unleash the true potential of your AMG! Our turbo upgrade for your M157 powered Mercedes consists of a complete replacement Garrett ball bearing center cartridge opposed to a wheel swap upgrade where just a larger compressor wheel is installed on the OEM journal bearing turbo. Our ball bearing units are built to take more abuse, consist of less moving parts and have a quicker boost onset than a standard journal bearing turbo. The Alpha 9 Turbocharger Upgrade provides enormous gains in horsepower and torque throughout the entire rev-range WITHOUT any added turbo lag! It’s a win/win situation that is unheard of in the industry provided by the latest in turbo technology. The new Alpha-spec billet compressor wheels utilize the latest design software and machining processes for maximum output and efficiency. The larger turbine wheel handles the additional airflow provided by the billet compressor wheel to keep the system breathing freely providing a well-rounded upgrade. Your Alpha 9 powered BiTurbo will put out an astonishing 750+HP/770TQ on pump fuel without any other modifications. Choose the optional race fuel calibration (100 octane unleaded) and that number jumps to 850+HP/850+TQ! Initial testing on our 2012 E63 AMG test vehicle using race fuel netted a 0-60 time of just 3.3 seconds and quarter mile time of just 10.7 @ 135mph. What’s most amazing is all of this is accomplished with just tuning and a turbo upgrade. When you punch the throttle your passengers are going to be in for quite a surprise! We re-contour the OEM turbine and compressor housings to fit the larger turbo so to the untrained eye, they look factory stock. We even retain the factory heat shielding for safety and to keep this turbo upgrade under the radar. With the Alpha engine computer calibration your AMG 5.5L equipped Mercedes Benz will exhibit smooth, stock-like driveability. The only difference is a dramatic increase in power and acceleration that will leave your competition in the dust! Another unique benefit to this turbo upgrade is it can be complimented with future Alpha products to make even more power. Once you have this turbo upgrade there will be no need to do things over again should you want to further modify your AMG down the road.